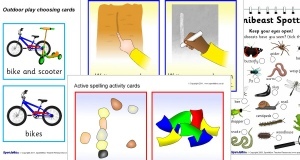 A useful selection of parachute game ideas contributed to SparkleBox by Denise. This is not so much a game, more an essential starting point for parachute play. Get everyone to spread out the parachute and hold the edge, spaced out more or less evenly so they're standing in a circle. Pull the chute taut and lower it to the ground (or knee level). On the magic word (e.g. Mushroom!) everyone pulls the chute upwards (don't let go). It will fill with air and rise up like a giant mushroom - or igloo. To get it as high as possible everyone must take a couple of paces towards the centre as the chute rises. It's good to practice this so that the group can learn to work effectively as a team and get the chute really high. It won't work without co-operation. • Everyone mushrooms and then runs to the centre, still holding the chute. • Everyone mushrooms, then lets go, especially outdoors on a windy day! • Everyone lets go at exactly the same time. If there isn't any wind, the chute will retain its perfect mushroom shape and rise straight up in the air. Indoors it may go up to the ceiling. To get this right it's best for someone to shout "One.. Two.. Three.. Go! ", or similar, immediately after the "Mushroom!" instruction. For everyone to let go at exactly the right instant will take practice and concentration. Groups of children who haven't played with a parachute before will probably be delighted and fascinated by the effect for quite a while before you move on to any other games. It's particularly spectacular when the sun is shining down through the chute. Everyone holds the chute taut. Place a large ball near the edge. Try to make the ball roll around the edge of the chute. To do this someone starts the ball rolling. As it comes towards you, you lower the edge you are holding, and as it goes past you raise your edge. When all the players do this in synchronization it creates a wave going round the edge, pushing the ball round in front of it in a smooth, steady circle. It can not be done without concentration and co-operation! However, it is very rewarding for the group to eventually achieve a smooth, continuous motion. Once you've done this try speeding up - or change direction. Have the children get on their hands and knees under a large "turtle shell" and try to make the turtle more in one direction. As a cooperative game, children have to work together to get the turtle to move. Variation: Have the turtle go over a hill or bench or through an obstacle course without losing the shell. We pretend the parachute is the ocean. I have them give me the name of an ocean. Children move the parachute in response to the 'weather report' they heard. (Encourages children to be creative). For example, I'll say, "I heard on the weather report this morning that there was a slight breeze over the Atlantic. What would that look like?" The children respond by making small waves in the parachute. Other suggestions have been - high winds, snow (we would have to pull it tight to make the ice), twisters, etc. Once they get the hang of it the possibilities are endless. Everyone sits on the floor in a circle holding the parachute stretched out with his or her legs underneath it. The chute is the sea and they are sitting on the beach, happily dipping their toes in the water. By shaking the edge of the chute realistic ripple or wave effects can be generated. Once the waves are going well someone is selected to be a shark and disappears under the chute. They move around underneath and because of the waves it will be difficult to see where they are. The shark chooses a victim and grabs him or her by the feet. The victim can give an appropriate scream before disappearing under the chute. This person now becomes a new shark. To prolong the game you can have the original shark revert to being a bather - or to make it more lively you can have several sharks in there at once. To finish the game you can choose 'once a shark, always a shark' - so everyone eventually becomes a shark. You can introduce freak weather conditions - or even a killer whale! From a sitting position, have the children pull the chute back and forth in a see-sawing motion. While gripping the parachute, everyone moves their arms up and down to make small and large waves. Have the children try to roll balls into the hole in the centre of the parachute. Ask the children to lift the parachute high over their heads and down again. Talk about the soft sounds and breezes that are created. Move the parachute faster and notice the different effects. From a standing position, lift the parachute from the ground to waist height, counting one (lift) and two (lift). On three (lift), have everyone raise the parachute high over their heads and then crouch down, pulling the parachute tightly behind them. A mushroom effect is created as the parachute settles. Lift the parachute high overhead. Call one child's name and have her run (skip, hop, twirl or crawl) to the other side before the parachute comes down and tags her. Have each child hold the parachute with one hand, extending the opposite arm out for balance. Run around in one direction, then change and run around in the other direction. A variation would be to use music as the cue for changing direction (i.e. direction can be changed every time the music stops). Have the children take turns running on the parachute as it lies on the ground, while the other children make waves. See how long the children can maneuver on the waves before falling down. The length of turns can be determined by songs that the children choose to sing (i.e. everyone's turn lasts the length of one song). Place a number of beanbags on the chute. Shake the chute to make them rise like popcorn. Place four to six pieces of yarn on the chute. By shaking the chute, try to make them hit the players on the other side. Keep track of who gets bitten. Put the pompoms in the middle. Sprinkle various sized pompoms in the top of the shoot and try to get them into the middle pocket. You could have teams with different colours and count how many they get in. Shaking rug involves rapid movement either light or heavy. Making waves are large movements to send billow of cloth up and down like waves. Waves can be small, medium or large. Kids can alternate turns to see who can make the best waves. Turn the body so that the chute is held with only one hand, walk, hop, jump, skip around holding the chute. It looks like a merry-go-round. Everyone lowers the chute and then on the count of three raise their arms high once the chute is quite high - everyone takes 3-4 giant steps toward the center and pulls the chute behind them and sit down with their bottoms on the edge of the chute. (although some might find this dangerous - just make sure the cat is crawling on all fours and not running upright) One child - the mouse - is under the chute, everyone is shaking it - quite close to the ground and another child (shoes off) crawls on top and tries to hunt and tag the mouse. We try to let everyone who wants to have a turn 'in the ocean'. Everyone is standing and one or two kids (shoes off) go toward the center and lie down - then we all make waves - it's a neat sensation. It is also neat to let one lie in the middle and go for a ride - when everyone is holding with one arm and facing the same direction and walking. While you're in the tent, try this: One person is selected to be a tent pole and stands in the middle, holding the centre of the chute as high as possible. The tent-pole person calls out someone's name and goes and sits down in that person's place. The person called has to rush to the middle and take up the role of the tent-pole before the chute comes down. Repeat the procedure as long as you feel like it. There's also a variation of Tent-Pole, which is called Jellyfish. In this version, all the seated people sway about as much as possible for the tent-pole to stay upright. From the outside, the chute should look like a gigantic quivering jellyfish. An alternative way to make a tent is to have everyone lie on their backs under the chute, heads to the middle with their feet up in the air. Stretch the chute tight and tuck the chute under your backs so it holds your legs up. You can bring in a soft ball and use your hands to bounce it around inside the tent. This game is good for recuperation after an energetic game. Hold the chute stretched out and have about a third of the people lie on the ground under it (best with heads near the middle). The rest mushroom the chute up and quickly pull it down again repeatedly. Air rushing in and out cools those underneath like a giant fan, and the sensation of watching the chute rise up and then come down on top of you is very strange. This game is best played with a large beach ball. You simply place the ball in the middle of the chute and by pulling upwards and outwards, throw the ball as high in the air as possible. This game can also be played by replacing the ball with a small child or doll. Mark a line across the diameter of the chute. Have equal teams hold the edge of the chute on either side. Throw a ball into the middle. The aim is to get the ball off the chute on the other team's side of the line, and stop it coming off your own side of the line. (i.e. to throw it over the other team's heads). You mustn't let go of the chute or touch the ball with any part of the body. Keeping score is optional. After several minutes of wild flapping and little progress the group should realise that co-ordination and strategy are needed to flick the ball off the chute. Start as above and this time have two or three children under the chute. The children under the chute have to try and push off the balls while every one else tries to keep them bouncing. Mushroom the chute and call out a command, e.g. "Change over if you are wearing red". Everyone wearing red has to run under the chute to the opposite side, before the chute lands on them (although that is part of the fun). Number the children by threes around the chute, so that you have an equal number of ones, twos and threes evenly spread out. Mushroom the chute, then call out a number and also a description of who you would like them to act as. We do a washing machine routine - 1/2 the children are the machine; 1/2 the washing. Just like washing routine: in goes the washing (children sit under the parachute) in goes the powder - and mix - give the parachute a good shake. The washing turns one way - run around in a circle turning the parachute - then the other. Rinse (shake) turn (circle) again. Shake and then dry - Up and down in big movements. Repeat - reversing roles of children. Number the children around the circle, say one to six. Lift the chute and on the third go shout a number, these children then have to swap places under the canopy before it falls to earth. They need to be told to head for gaps, keep their eyes open and try to avoid bumping into one another. Make sure that those who remain around the edge allow the canopy to fall rather than pulling it down hard. Simply passing the chute round in a circle rather like hauling in a rope. Place a light-weight football on the chute surface and experiment with moving it. What happens when you shake the parachute, can you flip the ball off over people's head? Can you develop a wave technique that will cause the ball to move in a circle? Using a small ball (tennis ball) can you drop the ball through the hole in the middle, can you stop the ball disappearing? These demand fairly sophisticated co-ordination skills, but in short spells can be fun. One volunteer on top, one beneath, with the idea of the top one catching the other, a bit like cat and mouse only in a different dimension. This can be surprisingly difficult. After lofting the chute several times everyone steps inside, bringing the fabric taut behind their body, either to shoulder height or to ground level with each person sitting on the edge of the chute, thus creating a sort of tent with everybody tinder the canopy. Simply an adaptation of any circle game, fishes in the sea, 1 sent a letter etc. using the chute to maintain the circle form. These sort of games consist of one or more people racing around the circle and back to their space, or any free space. You will find that the children soon get the idea of following the story and they will almost automatically stop the storm actions at the appropriate time. You can add details, like hauling on ropes or rowing with appropriate actions. You can illustrate Peter's faith by a person walking on the chute surface. Jonah's story - listening to parachute instructions - listening to God; obeying instructions - Jonah didn't; a storm at see, as above; man overboard, under chute; Jonah inside the fish, para-sight; out to Ninevah shade of the week etc. It is possible to twist all sorts of stories to use the parachute, however a good idea soon palls if it is used continuously, and we need to be wary of using a parachute rather than telling the story, so it is very much a case of first find your story and then see if it is appropriate. Number around the circle 1 or 6 as before. All of one number remove a shoe and throw it under the canopy. On a count of 3 the canopy is lifted, mushroomed up on the third lift and all those missing a shoe go into the middle, retrieve their shoe and get back to their place. If your canopy has a hole in the centre place 3 or 4 light small balls (tennis balls) on the surface and keep them moving around the canopy avoiding dropping them through the holes. The canopy is held taut at chest height with 2 or 3 foam footballs on the surface. 3 or 4 children underneath the canopy have to try to knock the balls off whilst those around the canopy try to keep them on. This works best if the canopy is marked in segments or halves; i.e. 2,4 or 6 teams. Stand around the canopy holding the canopy in both hands at waist level. It can be rippled up and down whilst holding it. Roll a football under the canopy. The canopy must be held tight at all times and the ball kicked under the canopy, a goal being scored when it comes out on any side. This is an adaptation of a country dance but works well with the canopy. Number off round the canopy A, B, A, B etc. Use a lively 'jig' tune which repeats AA BB AA BB etc. When the music starts: A Hold The parachute with booth hands, circle 8 paces clockwise B Holding the parachute with both hands, circle 8 paces anti-clockwise B A's turn to face clockwise; B's turn to face anti-clockwise. A's let go of parachute and to the music go under the arms of the B facing them. They do this seven times until they arrive facing, the eighth 'B'. B Holding the parachute with both hands all go into the middle twice mushrooming it each time. When You are tired on a count of 3 lift the canopy as high as possible, mushroom it and bring it down behind you and sit down. In this way you can make a rather hot airless tent supported on the heads. When you have finished quickly grasp the canopy at the centre, twist it slightly into a rope, wind it round your arm and stow it in the bag. This can be done very quickly and very cleanly even on damp ground. Or ... (indoors), tell everyone that on 3 they are to let the canopy go and STAND STILL. Mushroom it to a count of three, let go when it is fullest so that it soars to the ceiling. You should be able to step into the middle, catch the centre and deftly stow it before anyone moves!